Dundee attacking midfielder Gavin Swankie has returned to Arbroath on loan until the end of the season. Swankie, whose move to Dens was funded by Dundee fans, has failed to hold down a place at the First Division club. Manager Alan Kernaghan has had little chance to assess the 22-year-old, who has suffered injuries and illness. Second Division Forfar Athletic had wanted Swankie but returns to Gayfield Park just six months after departing the Third Division outfit. 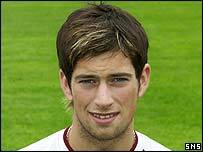 Swankie was signed from Arbroath by then Dundee manager Jim Duffy. But Kernaghan made him available for transfer as he had at least five players ahead of him for a starting place. Swankie had attracted interest from St Johnstone and clubs in England before First Division Dundee agreed a compensation fee for his services.